Come return again with us to the city plane of Ravnica with the Guilds of Ravnica Pre-Release – September 29th and September 30th, 2018. Get things started in a huge way at our Midnight Prerelease on Friday night / Saturday morning at 12:00am, after FNM. For the Guilds of Ravnica Prerelease we will be asking players to select a particular “Guild Pack” that they will use during the event. These Guild Packs are similar to the Prerelease Packs you may be used to, except instead of 6 booster packs they’ll include 5 booster packs + 1 “seeded” pack that corresponds to the two colors that represent your chosen guild. It is recommended that players preregister to make sure they get the two-color Guild Packs that they’d like. Please talk to someone at the store or email me at Chase@battlegroundgames.com to preregister. Sealed Deck Format: Each player receives one Guilds of Ravnica Prerelease Pack (5 Guilds of Ravnica boosters + 1 seeded guild booster + 1 guild promo + 20 sided spin down life counter) with which to build their deck. Two-Headed Giant (2HG) Sealed Deck Format: Each TEAM will receive 2 Guilds of Ravnica Prerelease Packs with which to build two 40 card decks. OUR CASUAL FRIENDLY PRIZE PAYOUT WILL AWARD PRIZE PACKS TO EVERYONE THAT’S WON TWO OR MORE MATCHES! Please note: Prerelease packs are first-come first-serve. If you desire a specific guild for your Prerelease Pack please tell us when you register so we can put one aside for you! 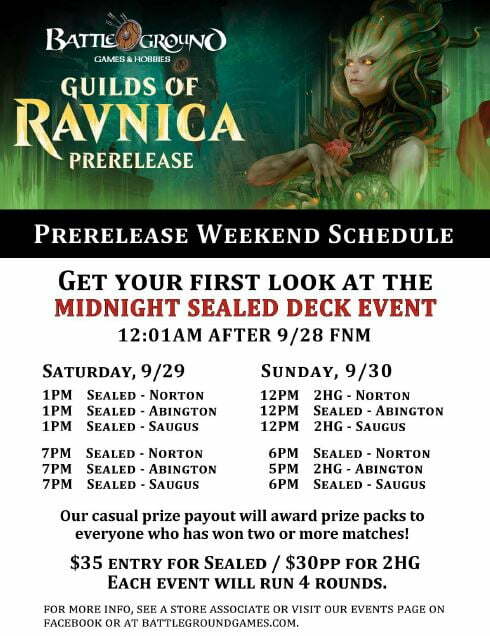 If you have pre-ordered a box of Guilds of Ravnica you may pick it up a WEEK EARLY at one of these events and also receive the Buy-A-Box Promo Impervious Greatwurm. Don’t forget to check out our Online Store for your Magic needs!